Are you a believer in ‘all good things come in small packages’? Here’s a few of our favourite examples, all love related of course. A dazzling engagement ring, a heartfelt love note, or better still, his last soft centered Rolo, they all look small but they’re thoughtful, romantic and melt any girl’s heart. We’re going to convince you with a real-life story that bigger doesn’t mean better when it comes to weddings. The story takes place at The Old Quay House Hotel in Fowey. The 11 bedroom boutique hotel on Fowey’s fashionable waterfront is described as a hidden-gem on the South Cornwall coast. It’s a dream wedding venue for small weddings. It’s charming, stylish and chic, a world away from the cold, airy venues that lack character and warmth. Its picturesque setting overlooking the Fowey River is most couples’ idea of perfection. It certainly was for Carole and Giles who celebrated their special day at the hotel late last year. The moment they set foot in The Old Quay House Hotel, they knew they’d found their ideal wedding venue. “A home away from home” is how they described the luxury hotel in Fowey. The couple celebrated with a small and intimate ceremony surrounded by 22 members of close family and friends. Carole and Giles live in Lincolnshire and met through work a few years ago. 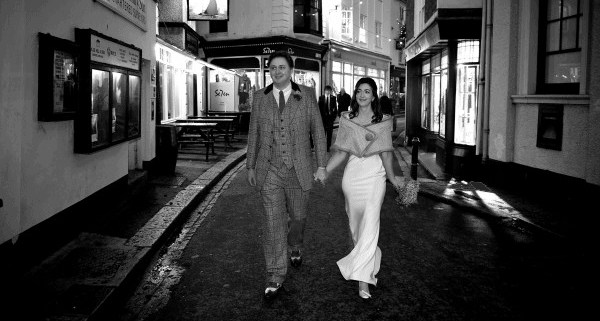 They began their love affair with Fowey after falling head over heels for its charming Cornish streets and magnificent country and coastal views. Whilst on a picnic at Gribbin Head near Fowey late one Easter Sunday, Giles proposed. Walking out to the Gribbin was the first walk that Carole and Giles went on when they first came to Fowey. To cement their love with Fowey they bought a second home here and escape to their romantic retreat as often as they can. They wanted somewhere the whole family could fit comfortably, where they could be spoilt with excellent hospitality, great food, and luxury accommodation. And so, the Browns and the Askers took over the hotel for 2 blissful days making the most of having the place to themselves. The happy couple took the deluxe room with fantastic estuary views – first pick of course! Giles’s young boys, the princes of the family, felt like kings in their super-king beds and loved the hot chocolate room service. They certainly made themselves at home with the tinkling of champagne glasses echoing long into the night. In the run up to the big day, nothing was too much trouble for the Old Quay House team. While the team set to work transforming the sophisticated dining space into a wondrous wedding wonderland, beautiful cream and red flower bouquets arrived courtesy of fleurtations and a magnificent chocolate ruffles cake made by the brilliant chocolatier Nicky Grant. With a team of chefs busy in the kitchen preparing delectable canapés from mini traditional Cornish pasties to the more exotic tempura prawns, there was just enough time for Martin aka Wedding Planner Extraordinaire, to put the final touches to the seating arrangements, calm Giles’s nerves and anxiously await the beautiful bride’s arrival from her room. As the time came to cue the music and guests took their last sip of pre-ceremony champagne, Giles watched as his stunning wife-to-be flowed down the white staircase. Carole’s dress and shrug were made by London designer Allison Rodgers. She worked her dressmaking magic to incorporate Giles’s love of all things fur and tweed by coming up with the idea of a tweed wrap with a fur edging. Giles got his shoes from a company called Barker. He originally found them in a shop in Truro and then managed to get hold of them online. We loved them and we’re told he receives a lot of compliments on them! His suit came from a company called Bookster who specialise in tweed outfits. Carole went with him to choose his suit as Giles is known for his rather flamboyant dress sense and she didn’t want to end up clashing. It was a beautiful, intimate ceremony and the happy couple couldn’t have wished for a better location. 1. Less people means more time to mingle! …with those you actually want to. Forget inviting people because you feel you ought to or to fill the church. Just invite them because you want them there. If you think about it, they’ll be the people who’ll treasure memories of your special day for years to come and without a qualm, spend hours reminiscing over hundreds of photos. You’ll have time to chat and mingle with every guest, making them feel special and not just part of the seating plan. Who wants to spend their big day feeling guilty for not having talked to Aunt Joan or a distant school friend that you haven’t seen for 15 years? With a smaller wedding, wave goodbye to brief and uncomfortable exchanges over a sea of heads and un-kept promises to catch up later, because time simply isn’t on your side. Instead, save it for enjoying every little detail and person to the fullest. It’ll make your day that much more enjoyable! If guests aren’t getting any attention, they’ll feel left out; it’s as simple as that. By opting for a smaller wedding with close family and friends, you’ve already shown them they’re an important part of your big day. Without the fuss and hundreds of people, they can share in the joy of before and after (but not too long after!) the big day without feeling like they’re getting under your feet. Doesn’t mean you have to rule out your special mother and daughter bonding time prior, you can do that too! That’s the beauty of a smaller wedding, there’s more time for choice. Can you imagine your friends and family objecting to a few drinks in the bar while you get ready? We didn’t think so! It’s easy to get caught up in the chaos of wedding arrangements. Amid umpteen phone calls, invites, catering, bridesmaids, when do you think about what you really want from your dream wedding? Perhaps you want your family to do the readings? Or maybe you want to organise a day trip for the following day? All your fab ideas are the first to go on the back burner when the bridesmaid fitting doesn’t quite go to plan or the printers have screwed up the invitations. Do away with all the fuss, and make your wedding unique and special to you. No DJ? No dancing? No bouquet throwing? Go for it! The great thing about having a small wedding is that a break away from the norm is almost expected and won’t come as a shock to your guests. In fact, it’ll probably come as a relief to those trembling at the thought of having to make shapes on the dance floor. And who wants to be knocked out by an incoming bouquet anyway? You could do what Carole and Giles did and let off twinkling Chinese lanterns into the moonlight. The shimmering reflections on the water and the stillness of night make for the perfect time to close your eyes, take your partners hand in yours and make a wish for your future life together. Like many other newly-wed couples, they didn’t want the day to end. “We would do it over and over again without a moment’s hesitation.” The wedding may have been small but it’s as we said before ‘all good things come in small packages’. To make an enquiry about a wedding at The Old Quay House Hotel, phone 01726 833302 or email info@theoldquayhouse.com. Perfect Partners – Food & Wine Congratulation to our guests last night..